Home » Columns » A Sad, 10-day Drama! Our Dasara, as we all know, is a grand ten-day spectacle. To different people it means many different things. 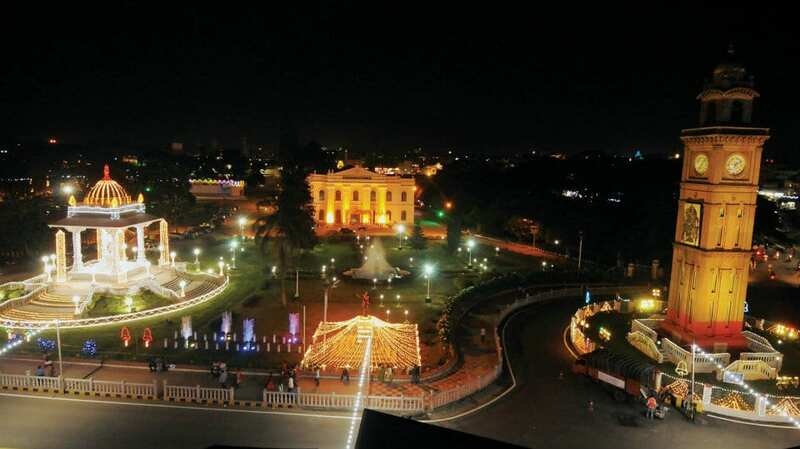 To the thousands of tourists who throng Mysuru to watch the annual show it means much excitement and fun. But to most Mysureans themselves the Dasara now only means a fortnight of congested and clogged roads which prevent them from going about their daily grind with ease. That is why most Mysureans prefer to watch all that happens during Dasara from the comfort of their armchairs, holding their mugs of coffee or tea in one hand and their TV remotes in the other! And, at the end of their evenings, when they change their channels, some change their drinks too! To our netas, the highest and the mightiest players, perched on the highest rung of the ladder of hierarchy, Dasara is a means of throwing their weight around. They do a pretty good job of this by much huffing and puffing and making their way to the front row of every Dasara event from where they can grin into the cameras. But this time, since this ladder of hierarchy is standing on the very unstable ground of coalition, it is indeed a little shaky and all those who stand on it need to take care to see that they do not indulge in too much jostling. Some of them cannot demand too thick a slice of the cake of adulation and have to sometimes settle for what they would otherwise have called just crumbs ! While some with slightly thicker skins do not mind being sidelined a little as long as they stay in the hallowed circle, all those with thinner skins and fragile egos prefer to stay away from the show itself. We saw this happening very recently when most Congress-persons shunned the inauguration of the festival atop the Chamundi Hill, calling it an event hijacked by the JD-S. But irrespective of what our leaders feel and where they stand while the show is going on, it is a well- known fact that the annual Dasara like all other activities in which the government is involved, enriches every one of them considerably! Kickbacks are inevitable when you are in politics and they are not considered unclean anymore and are therefore not unwelcome too. They are a just part of life and you don’t have to be ashamed of them anymore! Now, to all the bureaucrats involved in every activity connected with the show, our Dasara is a time of ‘good percentages’ because no file or bill moves anywhere without this lubricant! You add a drop of this and every file instantly becomes a ‘zip’ file! To the contractors and all their agents who actually execute the works, Dasara is the ‘Bonanza Time’ of the year. It is the time when every estimate and every bill is inflated as much as possible while the quality of the work they do is deflated as much as it can be. It is enough if the work done is barely visible without being able to serve its intended purpose beyond the ten days of Dasara. READ ALSO A Time to Ponder over Nature’s Fury ! You will know what I mean if you carefully watch every pothole that is filled and every stretch of road that is tarred during our Dasara. You will find that it invariably reverts back to its original state in a remarkably short time and certainly before the end of the calendar year! Incidentally, the Dasara lighting we are seeing this year is perhaps at its best but do watch out ! With most of our roads still being repaired you run the very real risk of your vehicle running into a bottomless pothole if you drive around completely mesmerised by the lighting. So in addition to what you are watching, please also watch where your vehicle is going! Now the saddest part of our Dasara, which I have been noticing over the past few years, is the special attention that the Mahouts and Kavadis of our Dasara elephants have been receiving year after year at the hands of our netas. They become our most special guests and every mundane thing they do or get done is highlighted as if it is what the Dasara is all about. This trend started after they once threatened to boycott the Dasara completely if they were not given a better deal for their role in the festival. They are now shown in the media either looking after their elephants or simply relaxing and getting their bodies massaged. The simple act of even having their hair cuts has now become a ceremonial affair! I don’t blame the media for doing this as whatever the government does, good, bad, ugly or even comic is naturally picked up and portrayed by the media. If it did not do this, the media would have nothing else to do! Our political bigwigs are shown serving the Mahouts and Kavadis their food at their Palace camp every year. While the dozen or so persons seated before the banana leaves remain the same, only the person holding the ladle keeps changing! Nowadays, different groups of people and different organisations too have jumped into the fray and have become waiters, not out of love for the humble folk but for the publicity the act brings them! The government even puts up a makeshift school in the Palace grounds for the children of the Mahouts and Kavadis and arranges special classes for them during the days of Dasara when they are away from their regular schools. The first question that I would like to ask here is why are only the Mahouts and Kavadis showered with this special treatment? Are they the only workers who make the Dasara possible? Are all the other personnel who toil just as hard by day and by night for our Dasara lesser human beings who can be ignored and sidelined? Take for instance all the road sweepers, the road repairers, the masons, the painters, the carpenters, the electricians, the gardeners and the Policemen. Are their roles less important? Can the Dasara go on without their help? I think not. Then why does our government not think of getting their bodies too massaged? Their weary bodies too must surely be aching each evening with all the hard work they do. They too need to take time off to get their hair cut and their bodies groomed in time for the grand finale. Will the government ever think of holding special massage and grooming sessions for them too and will we see this happening on our TV screens and the front pages of our newspapers? Again I think not. The second question that I would like to ask here is why should the children of the Mahouts and Kavadis attend special classes here in our city when all the school children across the entire State are enjoying their Dasara holidays at this time? Is this not a strange form of special punishment? The answers to all the issues I have highlighted here lie in simple appeasement for our selfish interests. Appeasement of the Mahouts and Kavadis as the elephants which they alone can handle and manage are a very essential part of our Dasara. Without their help we simply cannot think of continuing the tradition of the Howdah elephant leading the others which is what the whole Dasara procession has been all about over the centuries. Without the pachyderm procession there simply can be no Dasara. That is why the otherwise stone-hard government heart misses a beat and melts like warm chocolate every time the elephant keepers frown at the facilities provided to them. And, this ‘melting of the heart’ event too happens only once a year just like our Dasara! But let me tell you… all this is only a sad, ten-day drama and nothing more. For the rest of the remaining eleven months of the year when the Mahouts and Kavadis lead their lonely lives in their forest camps, away from public and government gaze, they just do not matter. No one in the government bothers to ask them if they are happy with their lives. No one bothers to know if their weary bodies ache or not and no one in power asks them if they have access to prompt medical care when they are in pain. No one asks them if their children go to school or not…let alone asking them if they learn something worthwhile that can take them somewhere beyond the boundaries of their dark forest of isolation and ignorance into the realm of a better and more enlightened life! It is enough for us if they are pleased and happy during the ten days of our happiness!